Frozen Shoulder is a condition caused by inflamed and thickened flexible tissue around the shoulder joint. The inflammation causes stiffness and pain around the shoulder joint hindering you from freely moving your hand. The condition begins with light pains on the shoulder and some stiffness. As time goes by the pain becomes sharper and the stiffness increases immobilizing normal movement of the affected arm. The major symptoms are pain and stiffness. This can make moving the arm difficult or entirely impossible. The pain is in the form of dull ache pain in one shoulder; specifically on the shoulder muscle that wraps the upper arm. 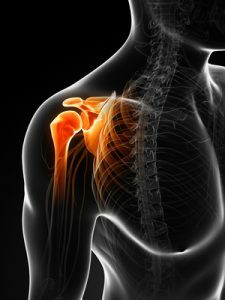 The freezing stage is characterized by sharp pain in the shoulder especially at night for between 6-9 months. As it advances to the frozen level, the pain might reduce but the stiffness gets worse. It could last anywhere from 9-12 months. The thawing stage, which is the final stage, happens after successful treatment. The pain begins to rescind. It takes between six months to two years. Frozen shoulder is attributed to a number of causes. Some causes that are natural are diseases like diabetes and Parkinson’s disease. Women have a higher chance of suffering from frozen shoulders compared to men. Other causes are physical; trauma to the arm due to a serious accident or injuries that result in your shoulder not being in movement for a long time. If you have a physical injury, exercising the affected shoulder before frozen shoulder begins to develop is a preventive measure against the condition. Despite medication, therapy is highly recommended. Physical therapy at New Beginning Physical Therapy is the best alternative to ensure a quick recovery from frozen shoulder. Therapy is considered an effective treatment mode compared to medication or having surgery. Physical therapists at New Beginning Physical Therapy ensure a successful treatment mode that keeps the whole arm and shoulder in movement. Physical therapists in Palm Desert, CA will administer stretching exercise on the shoulder to render a successful treatment process for the patient. If you are looking for the best physical therapist in Palm Desert, CA, you will definitely be referred to New Beginning Physical Therapy.